Perfectly designed to keep your toddler happy and hydrated. Insulated base to keep drinks cool and encourage drinking. Removable, two-piece, non-spill valve keeps mess to a minimum. Chunky yet lightweight with easy-­grip sides, perfect for little hands. 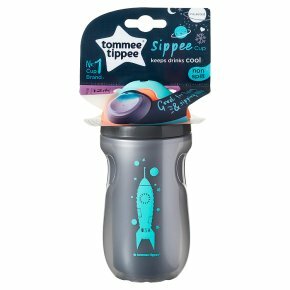 All Tommee Tippee cups are BPA free. From 12 months onwards your little one will be crawling, walking and running around, so they'll need to start drinking more fluids. Our biggest Sippee Cup, which holds up to 260ml of liquid, is the perfect choice to keep active toddlers happy and hydrated all day. Insulated to keep drinks cool, this cup will encourage your little one to enjoy drinking so they stay hydrated. With a soft spout that's kind to little teeth and gums, easy-­grip sides, and a trusty two-piece, non­-spill valve it's perfect for drinking on the go. Important instructions included inside this pack. Please read and retain for future reference.